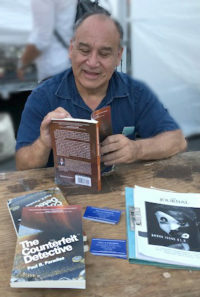 “Paul Paradise has written a novel that is not only an absorbing investigative thriller, but also a solid vehicle in which to experience the complexities of the counterfeiting and anti-counterfeiting world. 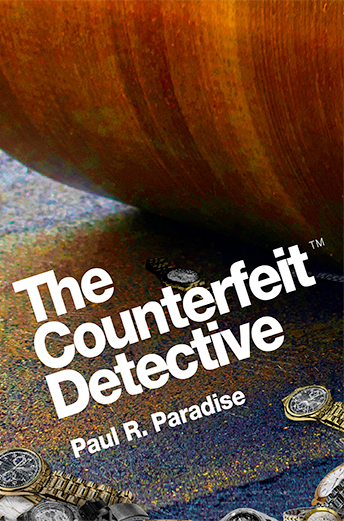 Through the eyes of his protagonist—veteran counterfeit private investigator, Theo Jones—Paradise adeptly weaves the reader through the ways of counterfeiting, and the means investigators use to combat it. “Paradise weaves fact with fiction, as his richly drawn character, Theo Jones, Private Investigator, takes the reader on a deadly journey into the dark underworld of trademark crime. 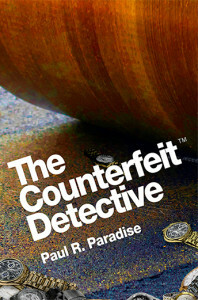 Counterfeit Detective is a non-stop page turner.” – – – Catherine Taylor, Author of Essence of Lilacs and No Rest for the Wicked. “Murder, family drama and betrayal will keep you turning the pages, in this fast paced crime drama.” – – – Gloria Sampson Knight, Founder: Salmagundi Mystery Book Club, New York City. “This enormously enjoyable mystery thriller is not to be missed.” – – – Linda L. Stampoulos, Ed.D., Author of Snake Hill (CCB Publishing, 2015) and other works. Peer To Peer (P2P) file sharing has evolved into a fierce public battle over the sharing of copyrighted content, especially music and video. The entertainment industry and many artists have objected to the theft of their work while the pirates have countered with the need for copyright reform. Napster, Pirate Bay and the Pirate Party are the headline making players in the P2P file sharing battle against the entertainment industry, especially the Recording Industry Association of America (RIAA), a trade group that represents ninety precent of the U.S. recording industry. The RIAA filed an estimated 30,000 lawsuits against P2P file sharers after Napster declared bankruptcy in 2001. The RIAA’s litigation blitz was a public relations disaster and became a rallying cause in the United States and Europe as the legal battle escalated. “As geopolitical barriers to trade are increasingly dismantled, this book will continue to be a useful reference for law or business collections.” – – – Library Journal. Called the business crime wave of the 21st century, trademark counterfeiting and product piracy are worldwide in scope and cost the U.S. economy billions of dollars every year. High technology and the globalization of business have made it possible to counterfeit and pirate a seemingly limitless number of products, from t-shirts, designer jeans, films and books to auto and airplane parts, and prescription drugs. The 1995-1996 trade dispute between the U.S. and China shows how serious the problem has become for American business and for U.S. diplomatic relations. Paradise explores the history of counterfeiting and piracy, shows how they are done, and the strategies that U.S. businesses are using to combat them. With interviews, commentary, and anecdotes by corporate attorneys, business leaders, and private investigators, this well-written book is essential for anyone interested in the damage that violations of intellectual property law are inflicting on world trade and what is being done to stop it. Paradise lays out the problem in Chapter 1 with a clear explanation of the differences between trademarks, copyrights, and patents, and the laws covering each. In Chapter 2 he looks at the role played by organized crime, gray market goods, the lack of intellectual property laws, and ultimately the threat to U.S. business. He discusses the recent investigations and disputes with China, and its aftermath throughout Southeast Asia. Chapter 4 focuses on the knockoff, chapter 5 on street peddlers and flea markets (and how merchants are retaliating), and chapter 6 on the tracking of counterfeiters. The entertainment industries and the pharmaceutical industries are then closely examined. He follows with equally comprehensive (and chilling) studies of automobile and aircraft parts counterfeiting and piracy in cyberspace. Paradise ends with a look at what is being done to counteract the inroads that piracy and counterfeiting have made into the global economy, and offers a provocative call for more and better efforts in the future. Book review written by LEWIS T. KONTNIK for Authentication News. Mr. Kontnik was a principal and founder of Reconnaissance International, the publisher of Authentication News, an international newsletter covering the issues, strategies, and technologies for counterfeiting prevention. 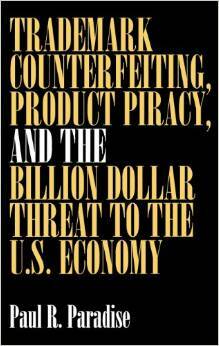 Mr. Kontnik is also the author of Counterfeiting Exposed: Protecting Your Brand and Customers (Wiley, 2003). Reviewed by Glen Eiden, U.S. Customs Special Agent, for Focus International Magazine. Book review by William Nix, Esq. for Entertainment and Sports Lawyer, Summer 2000. Will is Chairman of the Creative Projects Group, located in Sherman Oaks, Ca. He has served as Co-Chair of Baker Botts LLP’s Entertainment, Media and Sports Practice Group, and as VP of Legal and Business Affairs for NBA Properties and as COO of the Motion Picture Association of America’s global Content Protection Group. Reviewed by Louis Mendez for GC Magazine, Autumn 2003.